Prisma: An Inadvertent Cover-Creating App? A friend of mine has told me that covers should look good, because people unfortunately do judge books by their covers. With that in mind, I try to create the best covers I can, using what resources I have and looking to friends when I can’t do something with a cover. 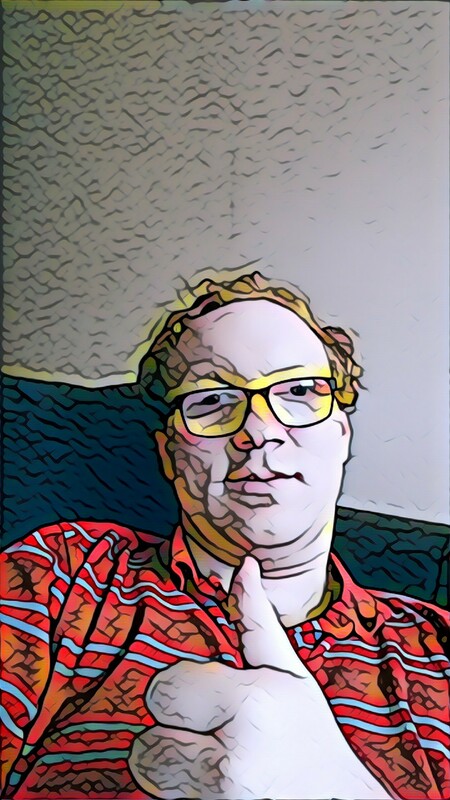 And recently, I came across an app that I think I can add into my cover creating resources: Prisma. 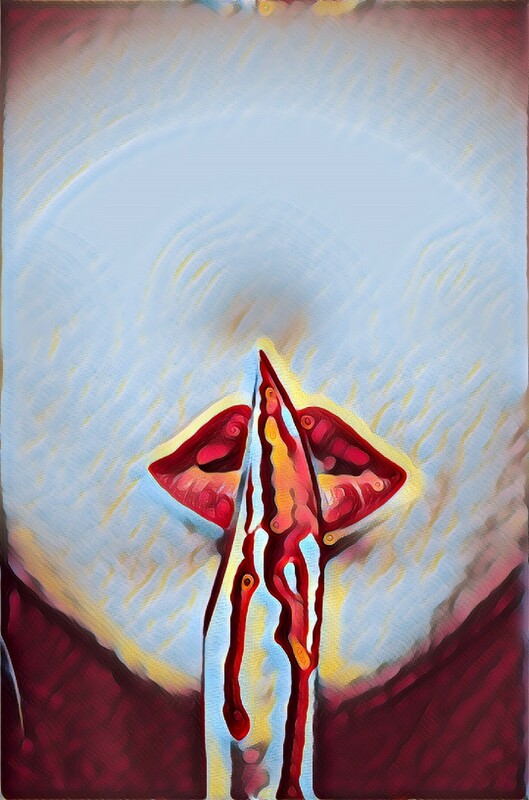 I got this app on the suggestion of a friend, who told me that it can be used to make your own artwork out of photographs (I’ve got my own apartment these days, and I’m looking to put some more art on the walls without breaking the bank). Prisma is a recent creation dating back to June 2016, and was created by Alexey Moiseenkov. The app relies on artificial intelligence and a neural network to take photos on your phone and turn it into art. The best part is, you can choose from forty different art styles–or as they’re called in app-language, “filters”–in turning your photos into art. Some of these filters come standard when you download, while I believe others can be bought from a store. It makes no sense to me, so it must be art! Yeah, it’s a fun app, and the filters allow for some really wonderful, one of a kind pictures for your personal gallery. But I realized soon after I made some art pieces with the app that there were further uses for this app than just stuff for my wall. Perhaps uses that even Mr. Moiseenkov hadn’t thought of. 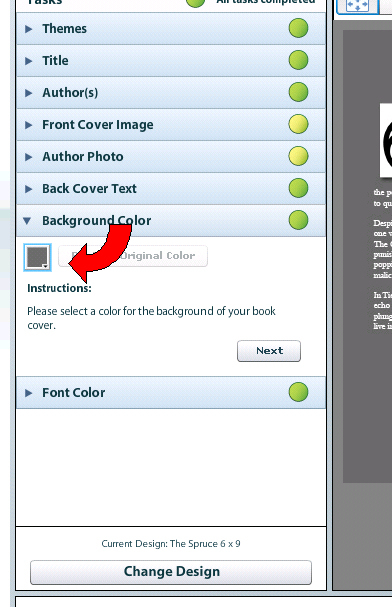 What if you could use this app to give your cover a special touch? Yeah, we work hard on our covers. We learn Photoshop, we download stuff from the internet, we take special shots in the middle of the night while it’s snowing heavily (or is that just me?). But sometimes we feel like there’s something missing, something that makes the cover perfect. Why not add a little art to it? It’s a good cover, and gives an idea of what sort of story it is. Problem is, the impression might be a bit too general, to the point that you worry it seems too run-of-the-mill. Nice! Not only does it look like it was painted, but the effect kind of brings to mind a strange, Warhol-esque vibe. Maybe this story takes place in Greenwich Village in the sixties, and there’s a hippie girl who isn’t so into peace and love, or something. Slap on a title and author name and you’re good to go to publish! 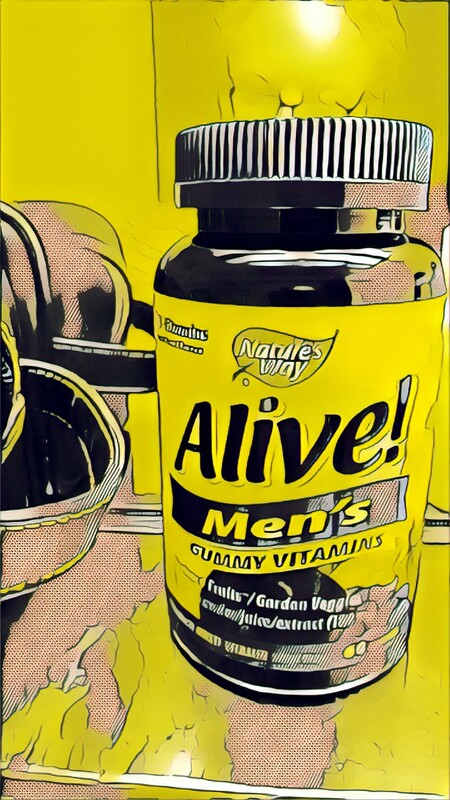 Bottom line, there’s plenty of potential for creating covers with Prisma. With so many different styles to choose from, there’s sure to be a way to make your cover look special. Download it to your phone, give it a go, and see for yourself. 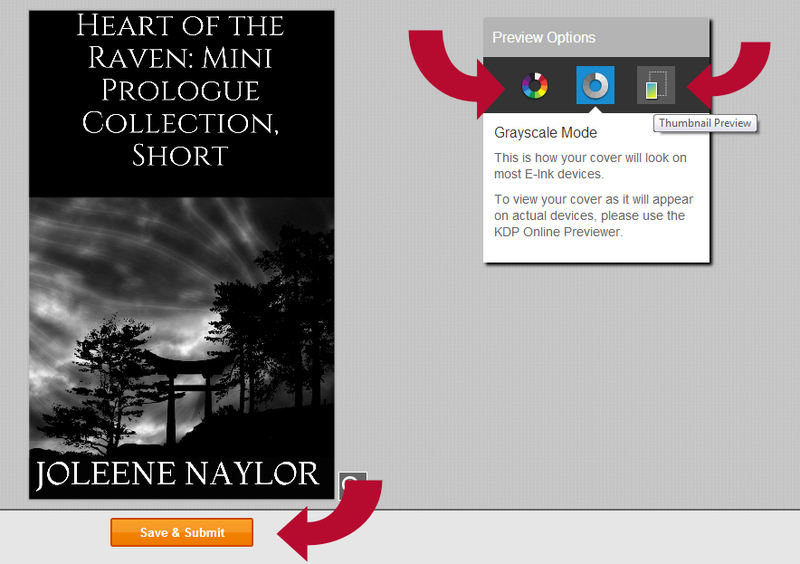 The other day I posted How to Publish in KDP and mentioned that I would cover how to use the new KDP Cover Creator. Here is that post. If you want to know how we got to this step, please check the previous post, otherwise I am going to assume you’re right with us at the “add a cover” stage. 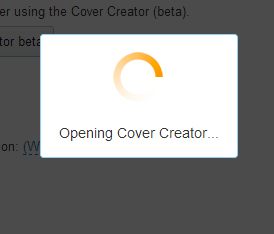 Click the “cover creator” button. This may bring you a pop up. 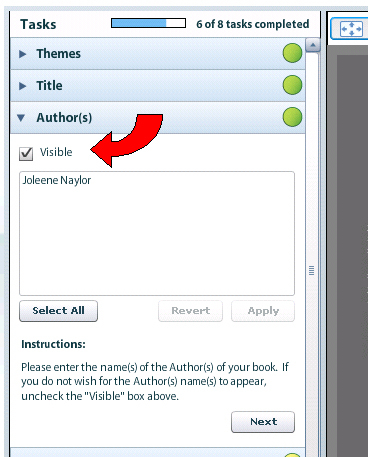 Depending on what you’ve been doing to your book, you may want a different option, but we want to save our changes so we don’t have to enter all the info again. A little box with an orange swirly will pop up. depending on your connection speed it may sit there swirling for a long time, or a very short time. My net was running good tonight so it went fast. 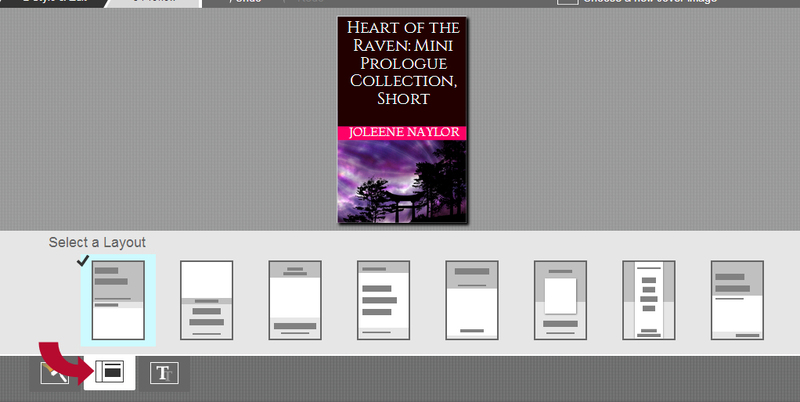 When cover creator first opens it will have a “how to” splash screen that doesn’t really tell you much of anything. Feel free to click “don’t show me this again” and then click continue. Now we have some more options. First we’re going to try browsing their gallery. I don’t really recommend doing this because if you’re using that image, who else is? But, we can take a look because those pictures are free and can always be a good cover placeholder until we get some cash or find a free image elsewhere. 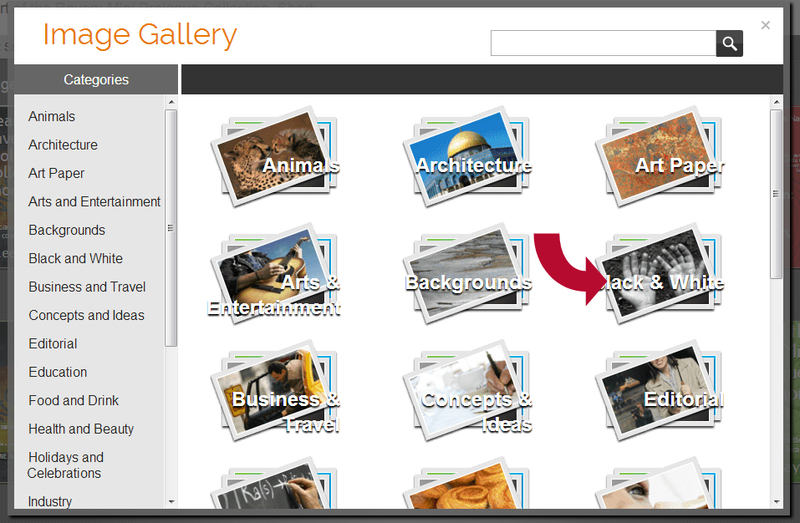 You’ll get a pop up with photo categories. Browse through them and see if there’s something you like. I am going to choose Black and White. 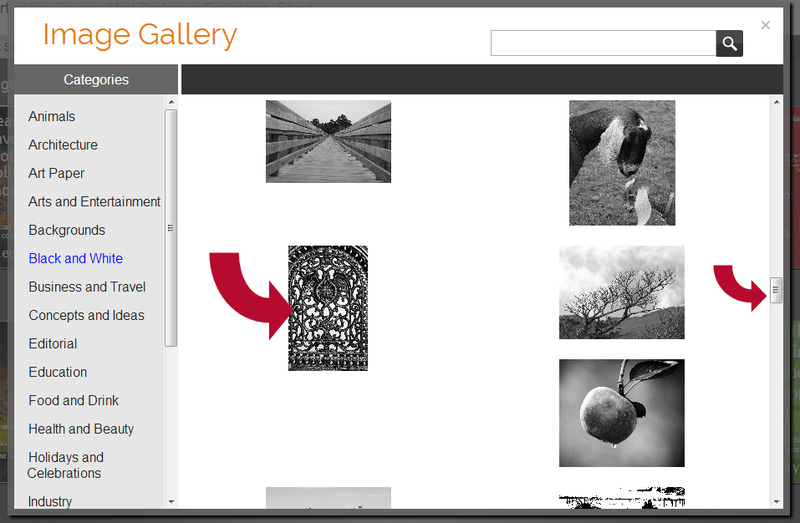 This opens a selection of black and white photos. Let’s scroll through and find something creepy and/or mystical, shall we? Once you’ve selected a picture, click on it. 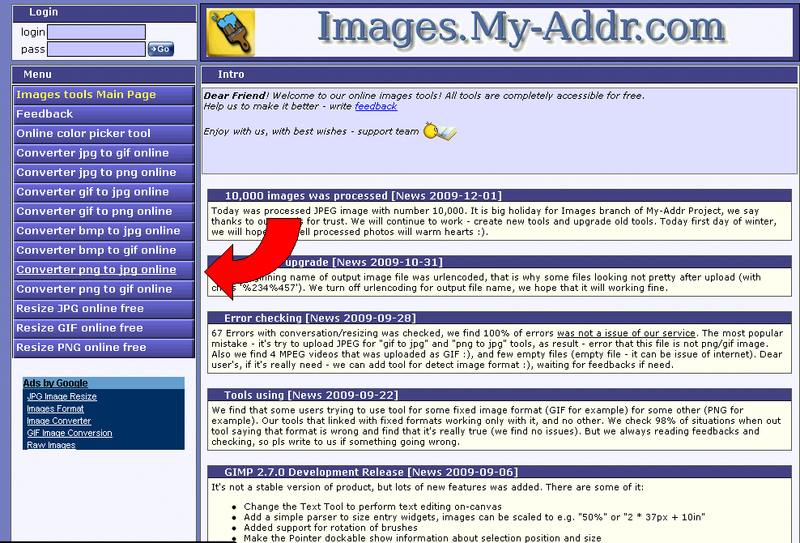 This will bring up an image overview and a bigger version. If you don’t want it after all, then click on the category name in the upper left to go back to the thumbnails. 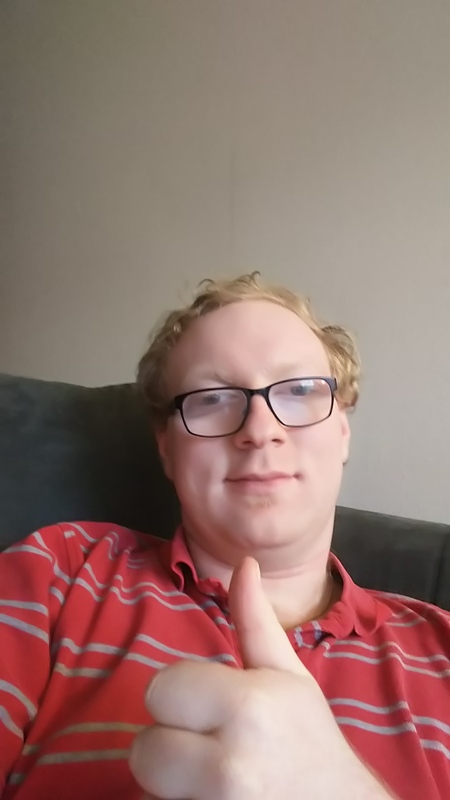 If you do like it, then click “use this image”. 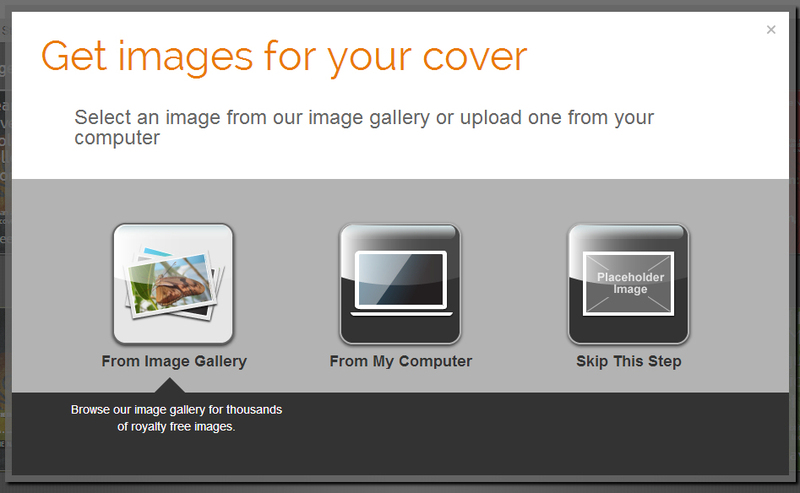 Personally, I am going to try uploading my own image now, so I am heading to the “choose new cover image” option. 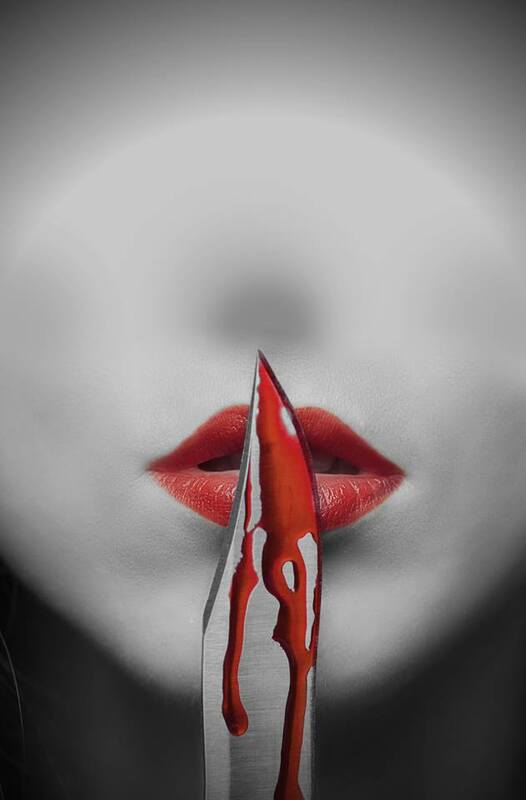 This pops up the image screen we started with. 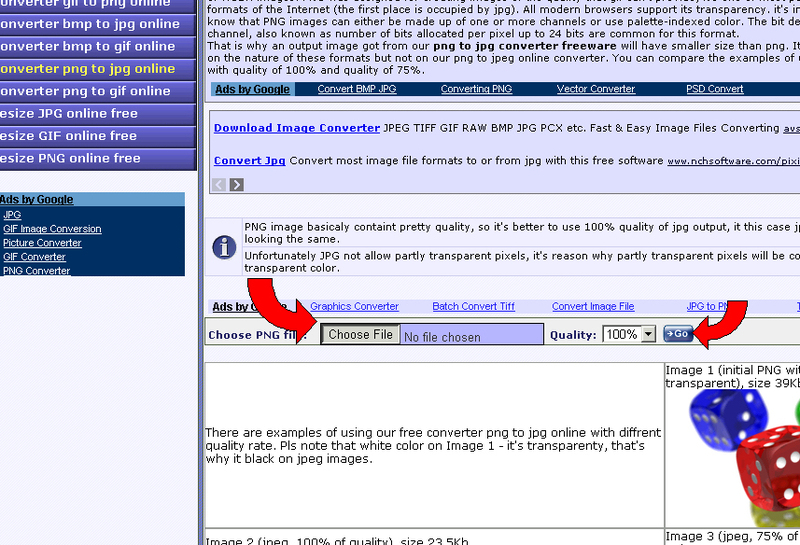 This time I am going to select “upload my own image”. Note: Images should be .jpg or .tiff and should be between 1000 and 2500 on the longest side. You’ll get another orange circle that may take a long time to disappear, or may go away fast, depending on your connection speed. This time we’re going to actually commit to this image and choose a design. Of course, you don’t have to. You can continue to upload and/or browse until you find something you like. 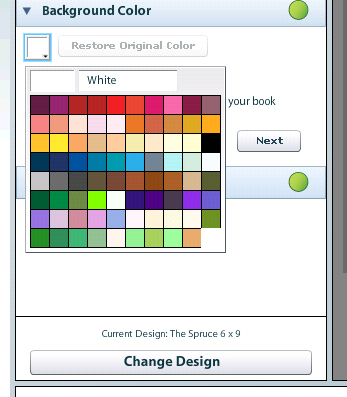 Then, choose a design when you’re ready. You’ll notice there are options that require no picture. 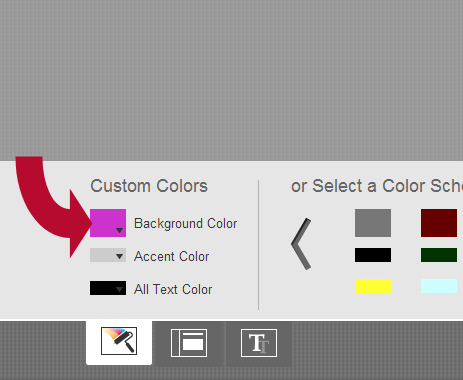 If you choose one of these, you still get to edit the colors, text, and layout. Since those tools are EXACTLY the same as the cover with photos, I’m not going to do a separate section for that. 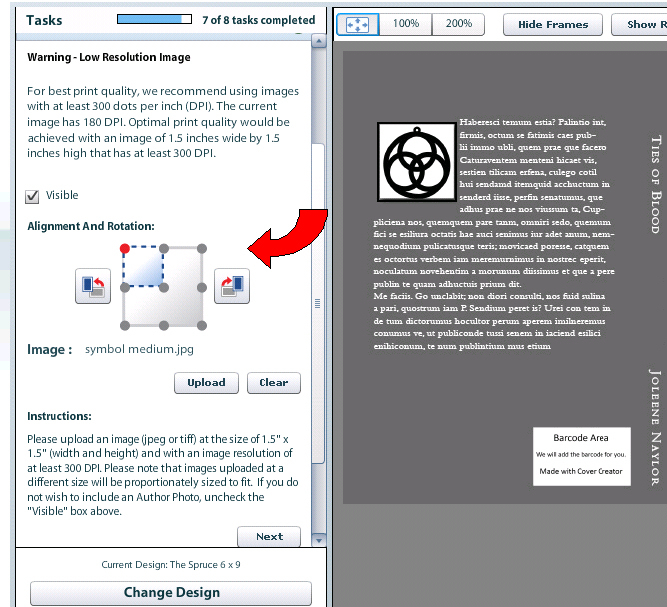 You can use the following steps for either the image layouts or the non-image layouts. 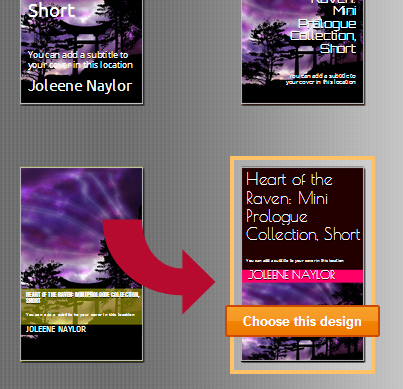 Hover over the design of choice so that it says “Choose this design”, then click on it. You’ll want to close the tool tip box by hitting the x. 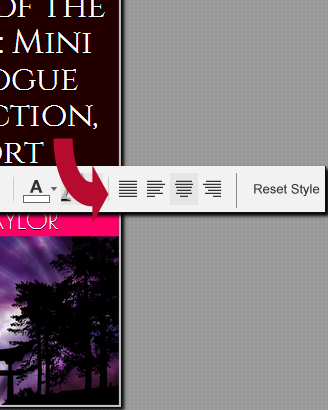 Remember that you can change designs at any time by choosing “Start Over” or change your image by choosing a new one. 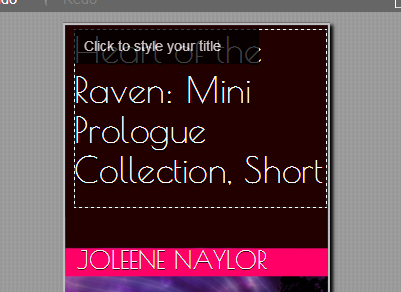 KDP has automatically put the title in for us, including the “short” that I added, which in this case looks silly. So I am going to close it out (by hitting the x in the upper right corner of the cover creator), change the title and go back in. Half a tick. 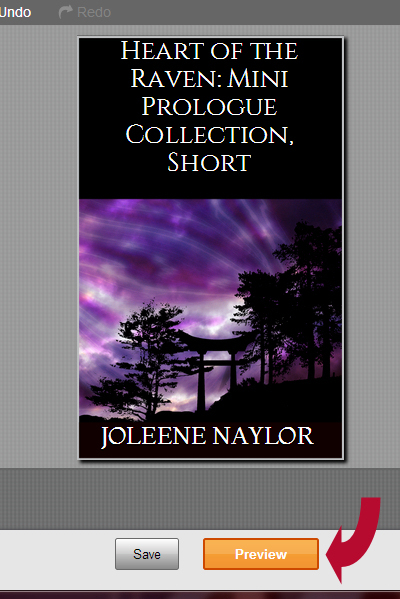 I changed the title, but it made no difference, as the cover creator refused to update. Since I am not going to use this cover it doesn’t matter for me, but if you plan to use it, make SURE your title is the way you want it before you hit that cover creator button. There are lots of things to edit here. Let’s start with the fonts. As you may notice, I centered mine and changed the font and the size, but left it white. Now you can do the same for the author (you can see an example of drop shadow on it) and if you have a subtitle (alas, I don’t). What about those other buttons? Let’s play with the layout next. Click through them to see the differences. 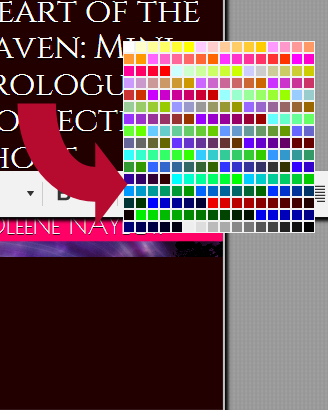 When you find one you like, click on the layout tool again to make the strip go away. Sadly, I like the original best, so I am sticking with it. Now it’s time to play with colors, because that neon pink is terrible! 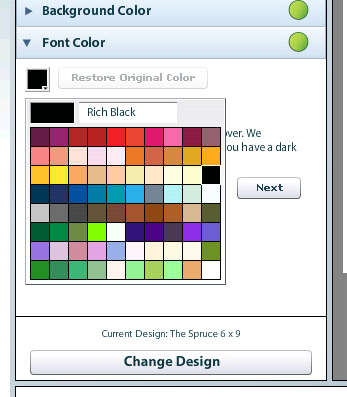 Terrible, I know, so we’re going to choose the colors ourselves. Repeat for the other colors. 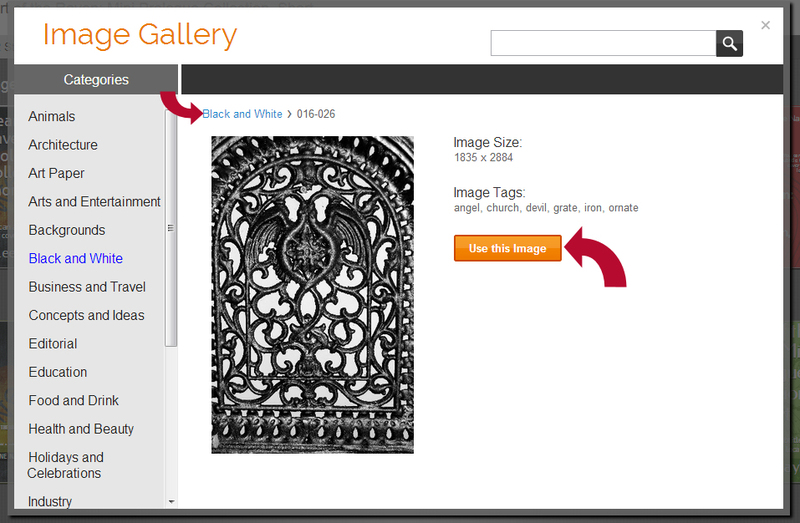 The preview lets you see it in color, black and white, and in thumbnail. Switch between them by clicking the icons on the left. If you’re happy with it, click the Save & Submit button. 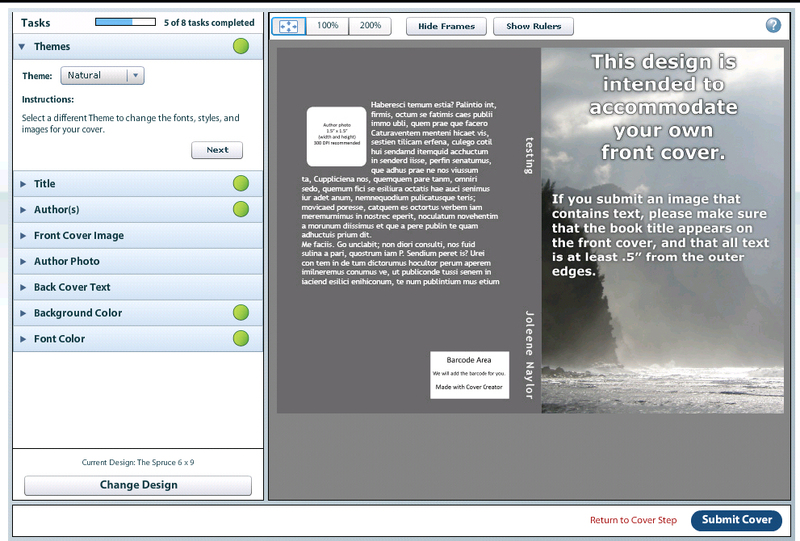 You’ll get a white screen that says you’re submitting your cover, and then be taken back to the edit project page. From there you can finish your publishing (see previous post) and submit your book. 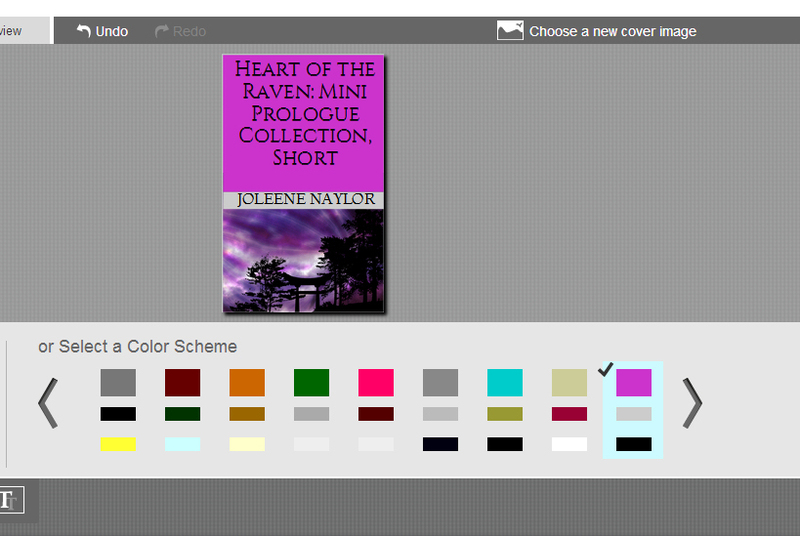 Have you tried the KDP cover creator? If so, what did you think of it? 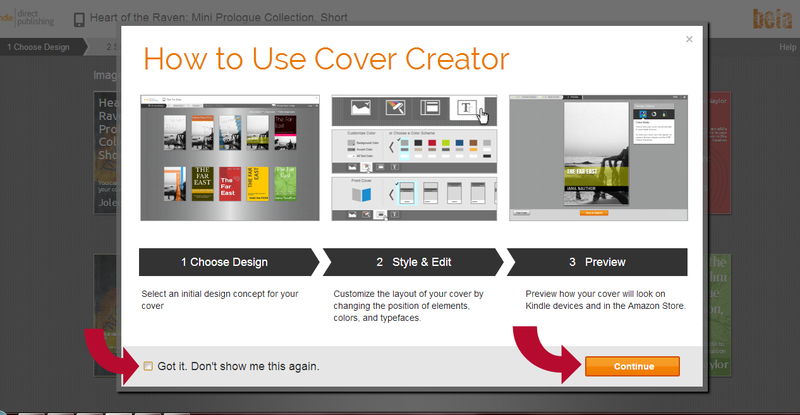 NOTE: As per information from the CS team, if you use Cover Creator to make your cover you can only use the cover to publish with them because the file was created by their creator. 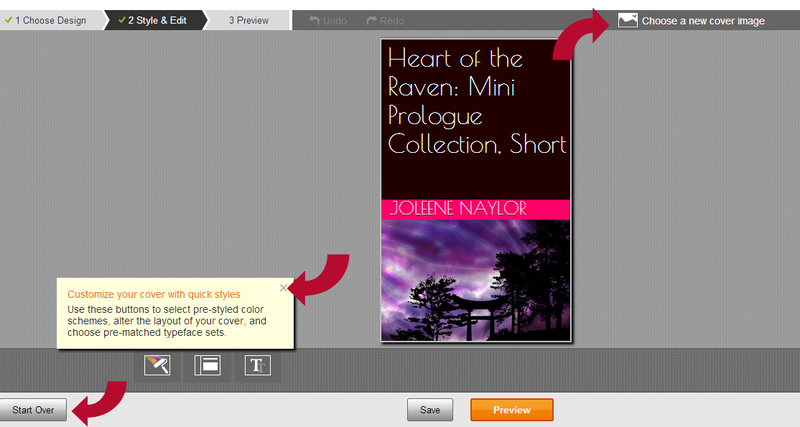 By popular request, I’m doing a post on how to use the cover creator on Create Space. 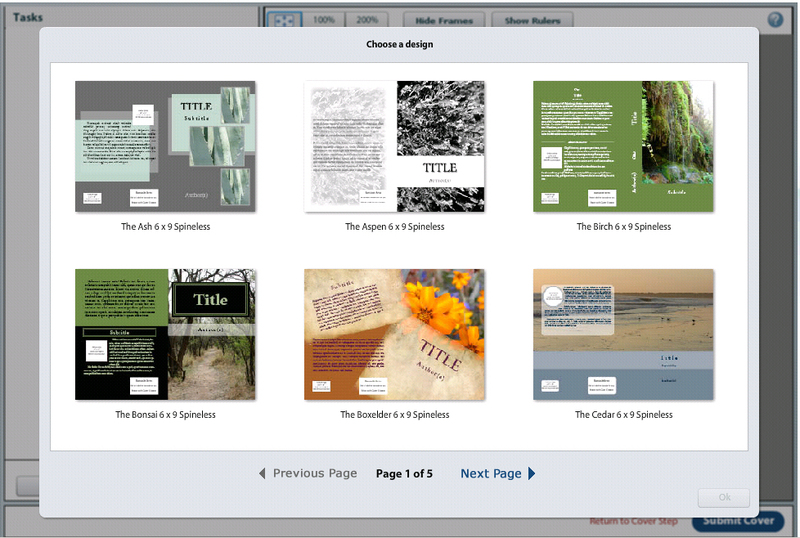 You will see cover templates. 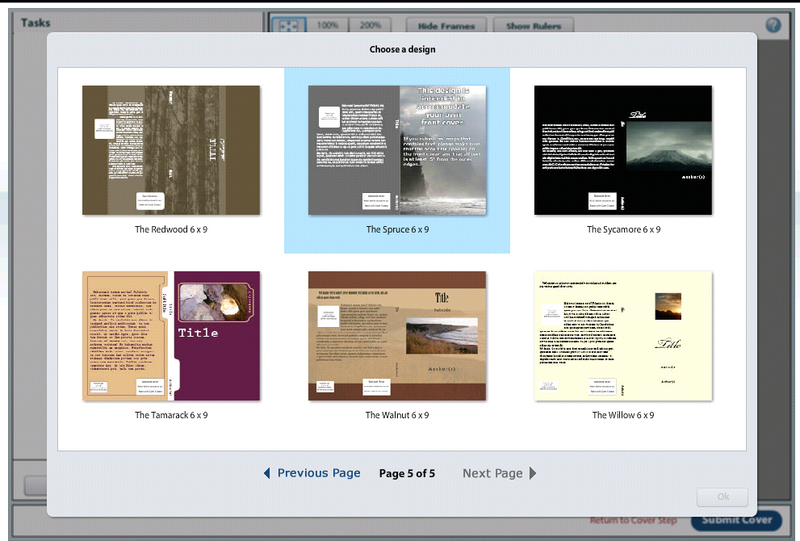 Which template you want to use depends on how much of a cover you have constructed already. 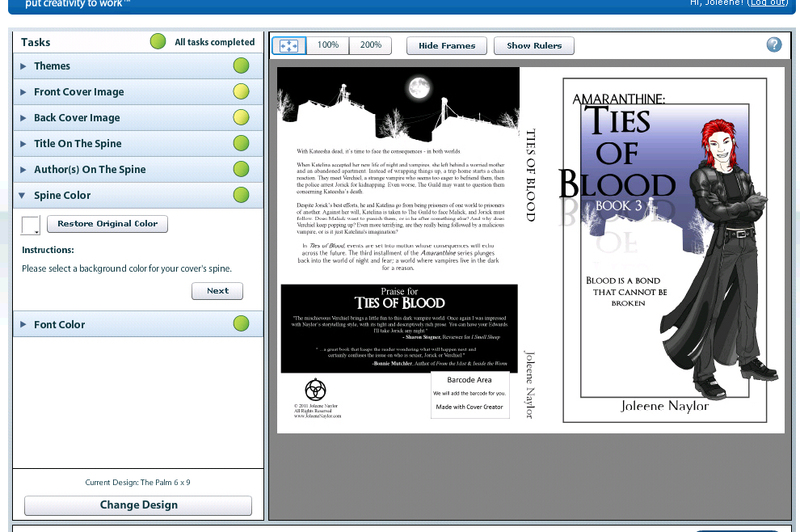 For instance there is a cover template to use if you have your front and back covers as single images – like this and this and another template to use if you have the whole cover made as an image – like this without the spine text. (I will show a screen cap of each at the end of this). But what if you have a front cover and no back cover? No problem. There is a layout for that, too. For this how to I am going to go with “we have a front cover but no back cover”. 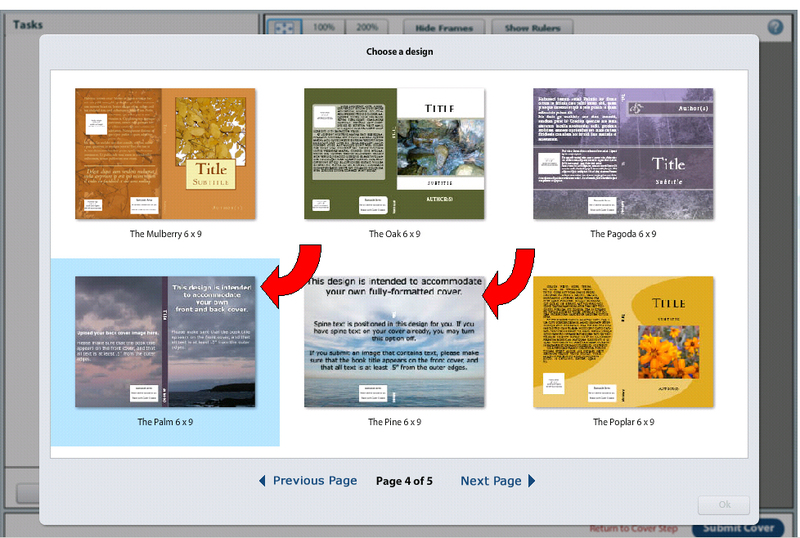 You will see there are several “headings” on the left side; theme, title, authors, front cover image, author(s), front cover image, author photo, back cover text, background color, & font color. 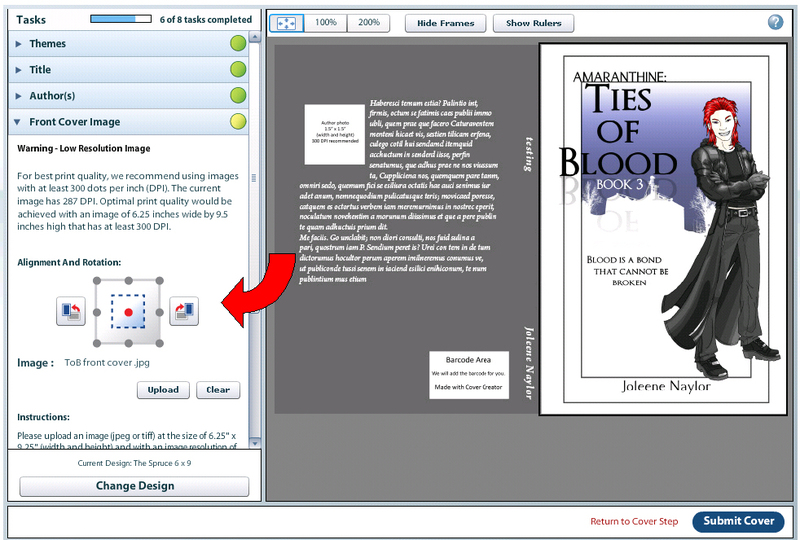 A the bottom is also Change design – if you decide you want a different template at any time, then click that and you will start over. Because we want things to match, let’s skip down to front cover image first. Then press the Go button. 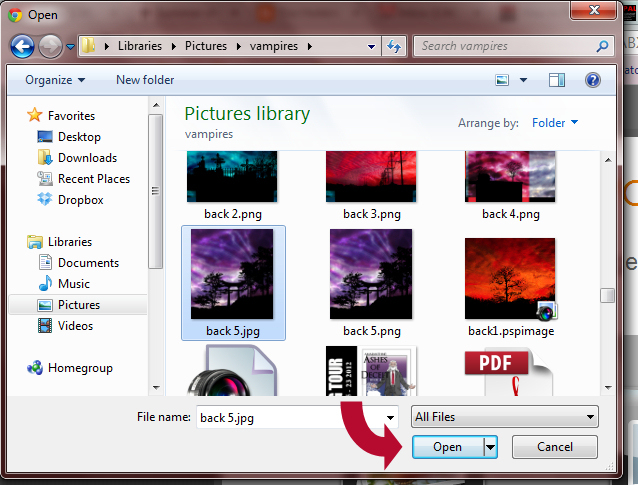 It will take a few moments to upload and will then ask you to choose a folder to save the jpg file. Save it and voila! You’ve got a jpg. 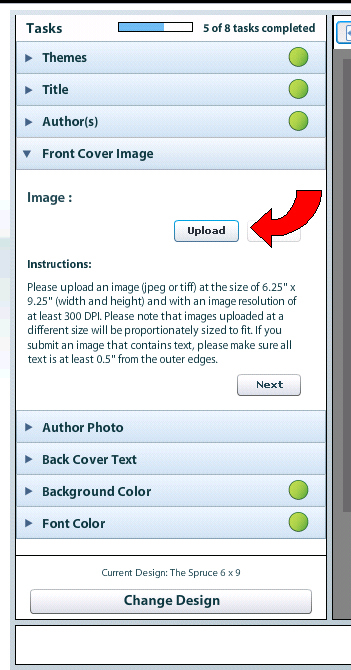 One other important thing about your cover image is that it MUST be a High res image – aka a BIG image that is around 1800 pixels wide (you can find these measurements under properties on most operating systems). If your image is smaller it will not print up as nicely. Now back to CS. 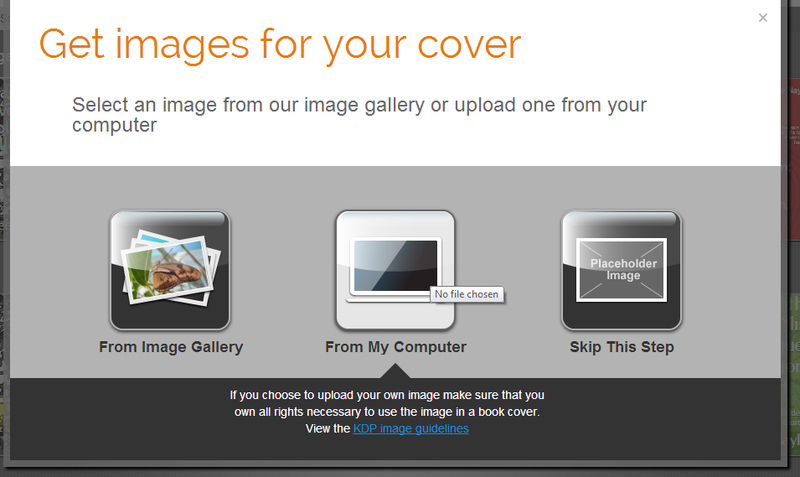 Upload your cover image. 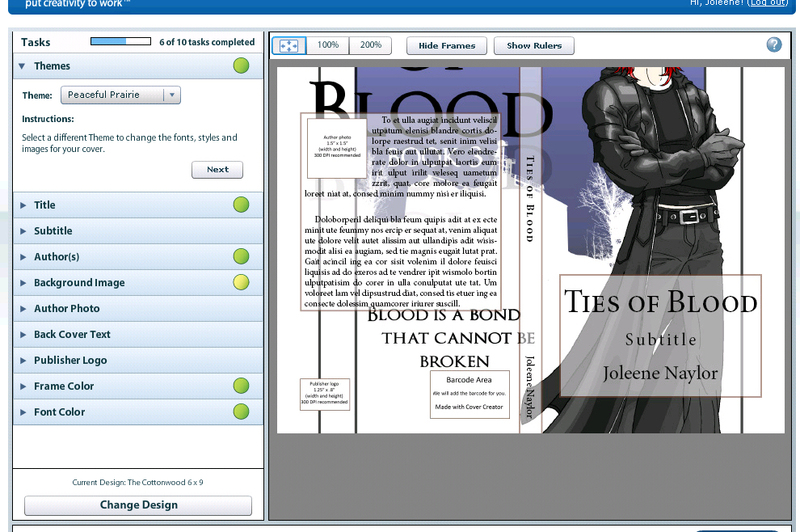 And it will automatically put it on the front cover (cool, huh?). 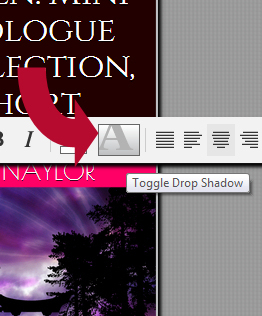 You’ll also see that you have some new things under cover image – alignment and rotation. In this case we don’t need any, but if you do, they’re there for you. Now let’s go to Themes. 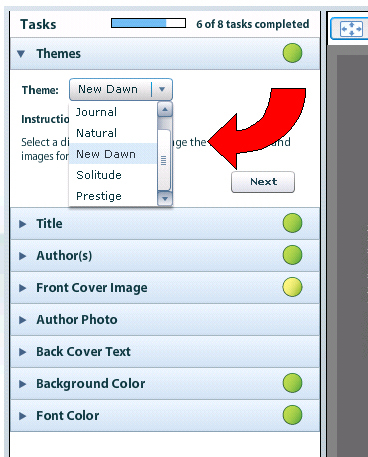 Themes are basically your font. 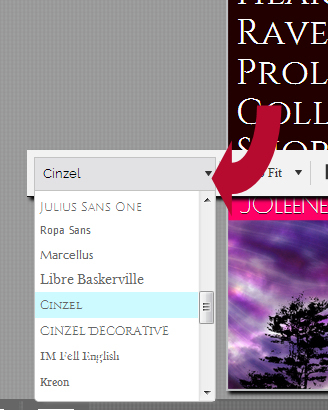 Use the drop down box under themes to find a font you like. 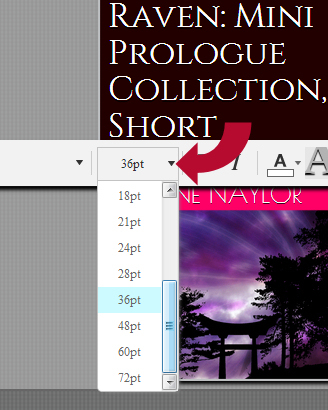 Under title you can edit the title that appears on your spine. Chances are you don’t need to (Since I named my project Testing, I had to). Make changes in the text box and hit apply. 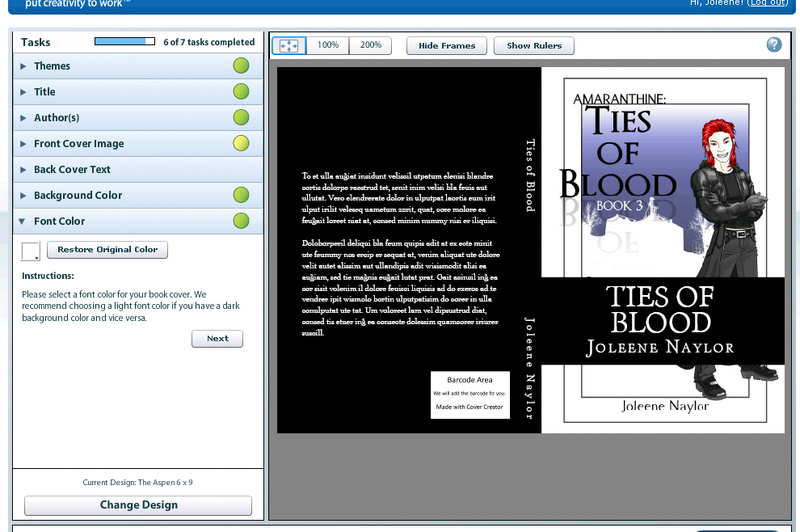 Author(s) is the same deal except it has the option to make the author name visible – or not visible – on the spine. Use the check box to make it disappear. 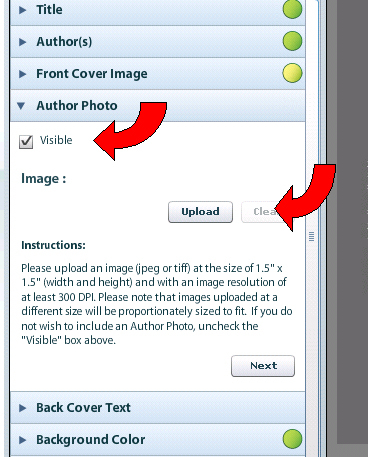 Author photo is also optional and has a visible check box as well as an upload button. Just like the front cover, it must be a jpg or tiff. Just because it says author photo, however, does not mean it has to be an author photo. I am using my books “symbol” in place of my photo. Just like with the front cover, you will get some alignment and rotation boxes, which again I don’t need, but if you do, use them. Now we’re ready for back cover text. You can also make this visible or invisible. 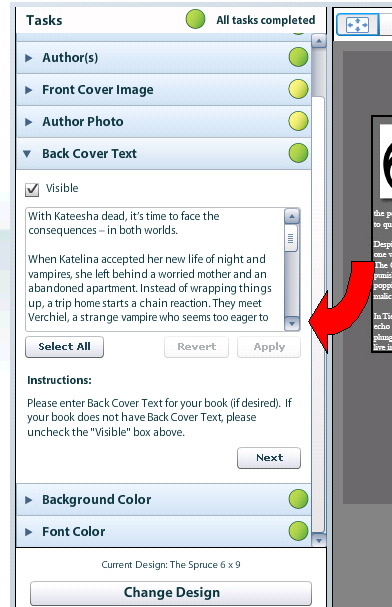 If you want it visible, copy your book description from wherever you have it (you should have it saved in a word file somewhere). Then hit apply. 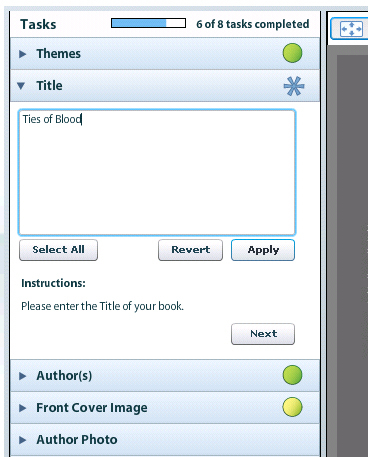 And then submit cover! You’ll get a “working” pop up. And then will be returned to your set up page. 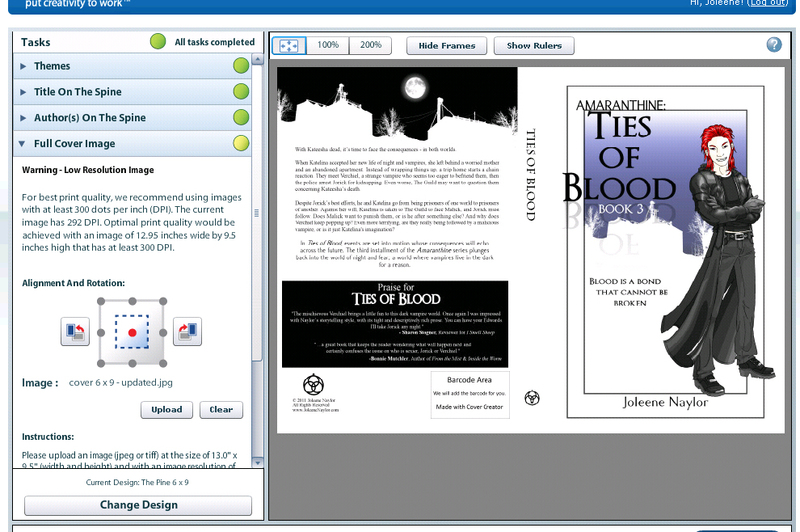 All the tools work the same, but note that the author name goes at the bottom so in the case of this cover it would cover up the symbol I have there. 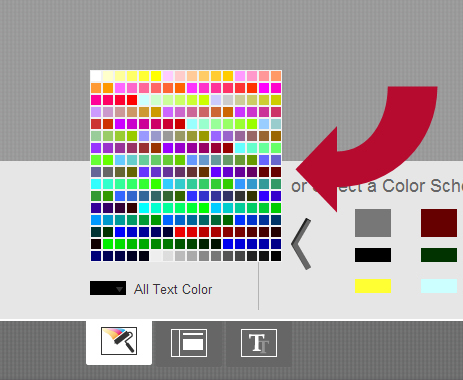 All the tools are the same with the addition of “Spine color”. 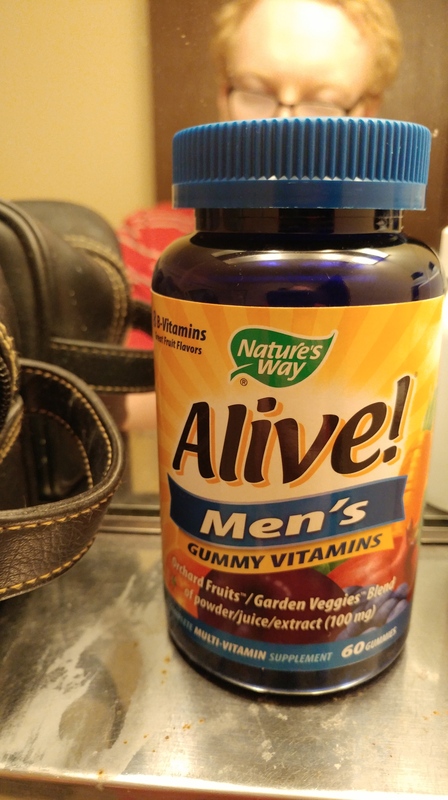 But what if you don;t have any of it? And that’s it. Your cover is done!